Ulrich Ostergaard is riding through the pain barrier. Proud promoter Ged Rathbone insists an appearance in front of the nation is a reward for every single person who helped him save Panthers. The Middlesbrough-based businessman stepped in to lead a successful winter fight for survival after the city club’s future was again thrown into jeopardy. And he is eagerly awaiting the arrival of the Sky Sports cameras at the East of England Showground on Wednesday (June 24) when Panthers take on fellow Premier League title hopefuls Glasgow. Rathbone said: “The Sky meeting is a great opportunity to showcase how far we have come in such a short space of time. “Last October it looked as though there might not even be a speedway club in Peterborough anymore, but we have achieved a lot in the eight months since then. “We are fighting at the top of the league and about to ride in a big meeting on national television. Panthers are currently third in the Premier League standings, three points behind leaders Somerset but with a meeting hand. Glasgow are fifth with both teams scheduled to be in action again before they meet in front of the nation. Rathbone has also dished out the plaudits for Panthers captain Ulrich Ostergaard who continues to pile up the points despite riding through the pain barrier. 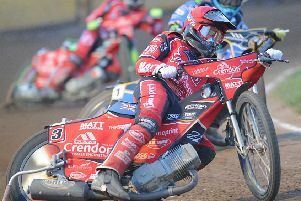 Ostergaard suffered damaged ankle ligaments and a broken toe in a track crash in a Danish Championship quarter-final 12 days ago, but still delivered two double-figure scores for Panthers in quick succession. He notched 11 in the home defeat at the hands of Ipswich last Friday and then contributed 10+1 as the city side responded with a Sunday success at Newcastle. Rathbone said: “Ulrich could barely walk after either meeting, but still scored double-figures for the team in both of them. “That just shows what he is all about and why I always call him ‘Mr Dependable’. He rode through the pain barrier in several meetings last season after a really big crash and he is doing it again now.